When China’s economic reforms were beginning, there was an expectation in the west that China’s financial markets would be opened to western banks and that China’s banks would be reformed along western lines. Joint ventures between Chinese banks and western banks, minority shareholding by western banks and the involvement of western banking personnel in assisting Chinese banks with their reforms were all seen as moves towards reform along western lines. This book analyses the role which western bankers have played in China’s economic reforms, focusing on their influence on institutional change and corporate governance. 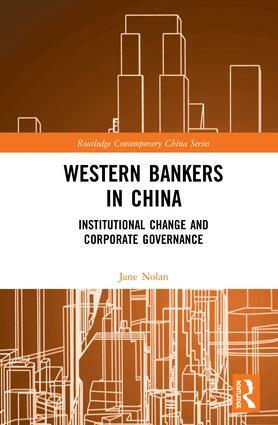 Based on extensive original research, the book shows that while components of western models of corporate governance have been widely adopted, the motivation for these changes seems to have been legitimacy-seeking by Chinese banks, and that whilst there has been relatively rapid change in the formal legislative environment, informal organisational practices are changing at a much slower pace. Alliances between Chinese and western banks are woven with contradictions and power games and so many actors in the Chinese banking sector seek to resist manipulation by their western counterparts. The financial crisis weakened the idea that western banks are a universally correct model and strengthened China’s resolve to keep control of its banking sector and manage it along Chinese lines. 1. Introduction: Western bankers in China. 2. Understanding institutional and organisations change in Chinese contexts. 3. The variety of business systems in China's banking sector. 4. Western economic ideas and the historical development of Chinese banks. 5. Regulating the banking sector: conflict and control in enforcement regimes. 6. Western investors and corporate governance reforms in Chinese banks. 7. Networking strategies of Western bankers: power, opportunism and guanxi connections. 8. The 2008 financial crisis and trust between Chinese and Western bankers.